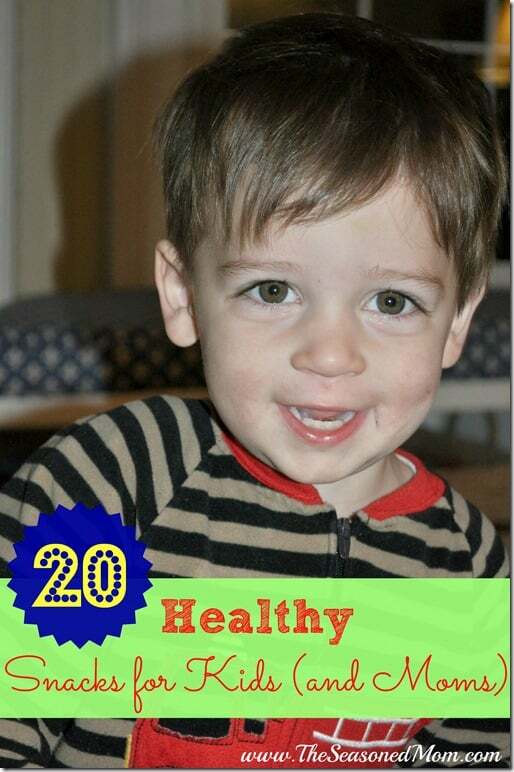 If you’re tired of seeing the same orange Goldfish every afternoon, check out this list of 20 Healthy Snacks for Kids, which will add some nutritional variety to your child’s diet, introduce them to some new foods, and make snack time fun again. Moms, feel free to indulge too…it might just help you pass by that late-afternoon chocolate fix! 1. 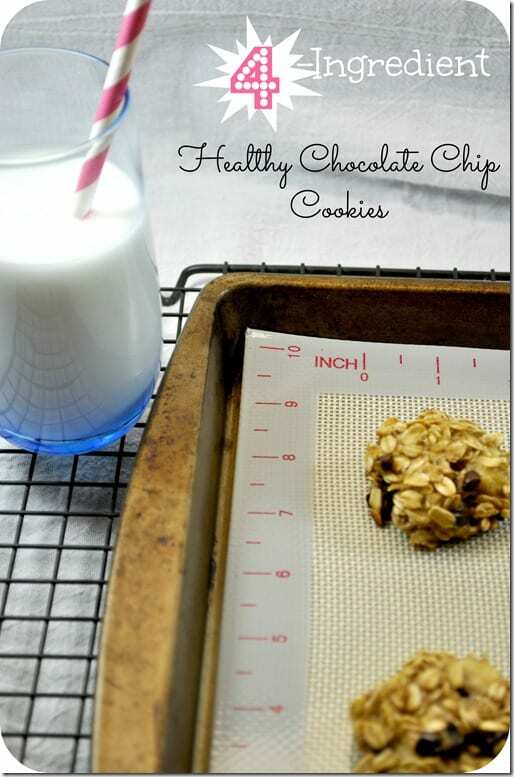 4-Ingredient Healthy Chocolate Chip Cookies: mix together 2 large, ripe, mashed bananas; 1 cup of oats; 2 tablespoons of miniature chocolate chips; and 1/4 teaspoon of salt. Drop “dough” onto cookie sheet and bake at 350 degrees F for 15-20 minutes. 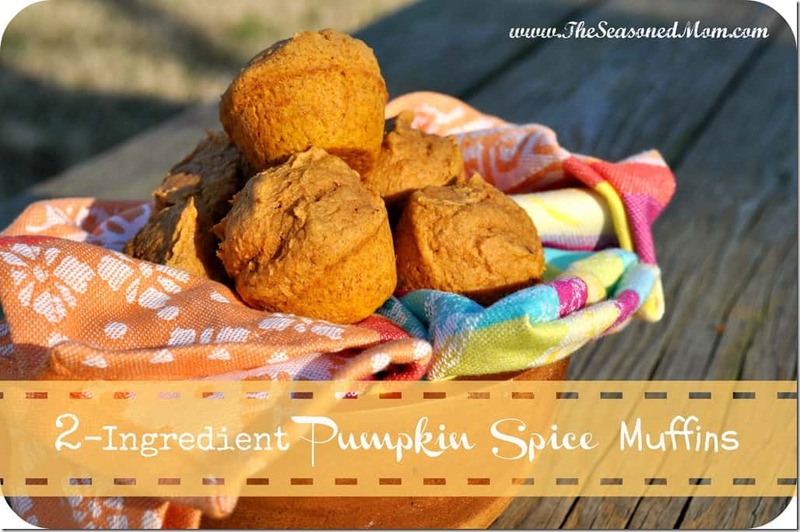 Printable recipe is here. 2. Peanut Butter Banana Sandwich (Without the Bread! ): slice a banana in half length-wise. Spread peanut butter on the top of one banana slice and top with the remaining banana. Instant sandwich, minus the bread! 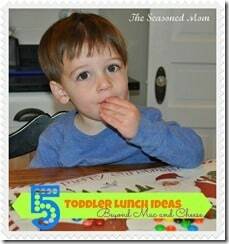 If you have a toddler, just slice the “sandwich” horizontally into small bites. My kids like to eat the slices with a fork! 3. Fruit Kabobs and Honey Yogurt Dip: For older kids, you can make mini kabobs using toothpicks. Little ones? Use a plastic drink stirrer or a wooden popsicle stick. 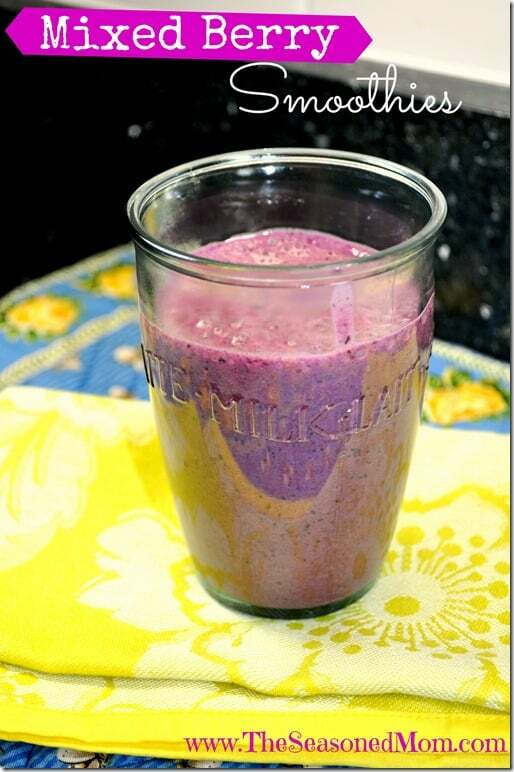 Add any favorite fruits on hand – grapes, apple chunks, berries, orange slices, you get the idea. Serve with a small bowl of Honey Yogurt Dip: just mix together 8 ounces vanilla yogurt, 1 tablespoon of honey, and 1/2 teaspoon cinnamon. 4. Homemade Popsicles using Real Fruit Juice. Have you tried these Zoku Quick Pop Makers? They’re amazing! It takes only about 7 minutes to make a popsicle, and they pop out flawlessly every time. No advance planning required! 5. Mini Rice Cakes topped with Ricotta or Cream Cheese and Sliced Strawberries. Try the caramel flavored miniature rice cakes for a sweet treat. 6. “Ants on a Log”: This oldie-but-goodie still tastes delicious! Spread peanut butter or almond butter inside slices of celery and top with raisins. Kids allergic to nuts? Try using cream cheese instead of nut butter. Drizzle with honey if they like it sweeter! 7. 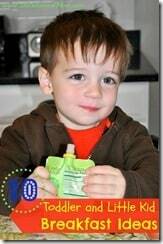 Smoothies: just like at breakfast, smoothies are a great way to get some fruit, calcium, and protein into your kid’s bodies at snack time. 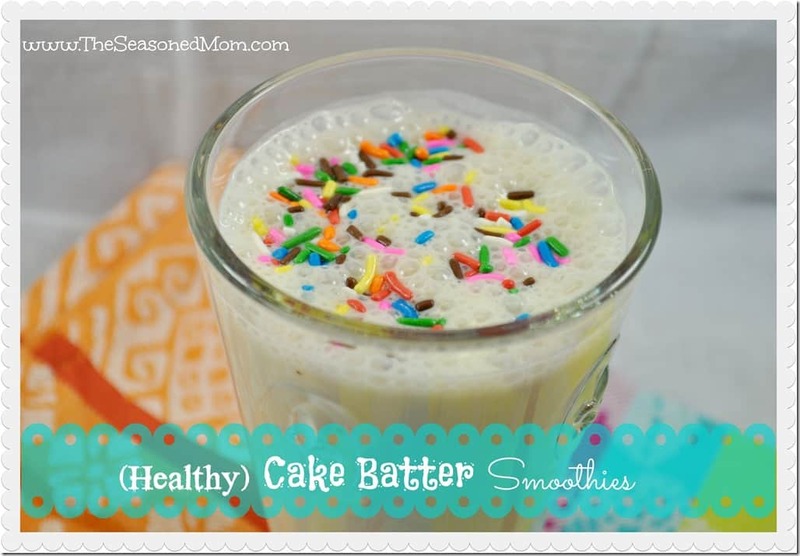 Try my (Healthy) Cake Batter Smoothies or my Mixed Berry Smoothies for an after-school treat! 8. Chips n’ Salsa: my kids love to dip tortilla chips in guacamole or mild taco sauce. Use whole grain chips for a healthier alternative, or melt some shredded low-fat cheddar cheese on top for some quick, homemade nachos. 9. Garlic Parmesan Pita Triangles: This was one of my favorite snacks as a child! Spread some butter, garlic salt, and a sprinkling of Parmesan cheese on top of a whole grain pita. Heat pita in toaster oven until butter and cheese melt and pita is browned. Slice into triangles and serve. 10. 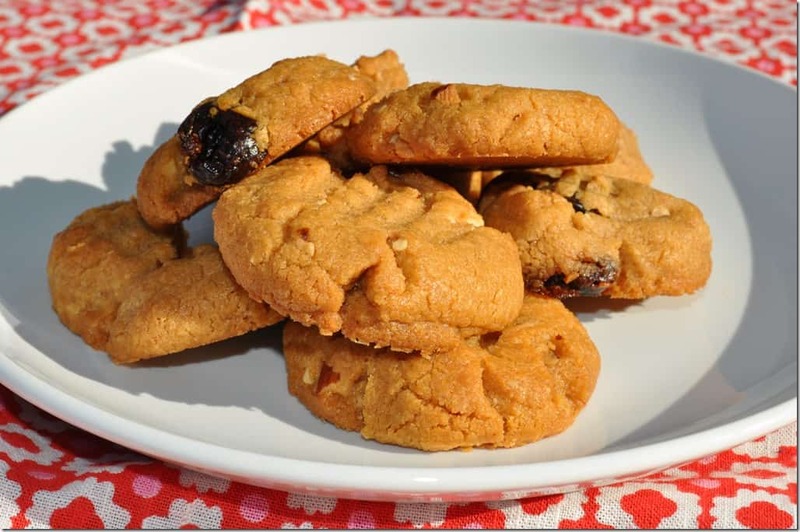 Cherry Almond Cookies: full of good-for-you ingredients like almonds, almond butter, and dried cherries, these cookies are soft, chewy, and very moist. Get my recipe here. 11. 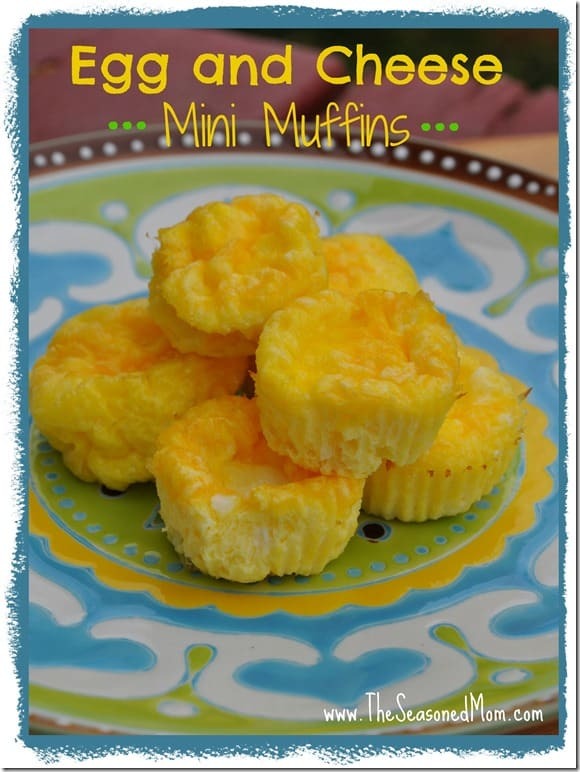 Egg and Cheese Mini Muffins: for breakfast or for snack, store these in the freezer and microwave them for about 30 seconds whenever you need a quick bite of protein. For a heartier snack, sandwich one of these in between a miniature whole grain bagel. The recipe is here. 12. “Apple Sandwiches”: Again, no bread required for these fruit sandwiches. Slice an apple into thin horizontal rounds. Remove the core from the center using a paring knife or small cookie cutter. Spread peanut butter and raisins in between two apple rounds for a small, healthy sandwich. 13. Whole Grain Crackers (or Fruit) Dipped in Nutella Chocolate Hazelnut Spread: this is one of my boys’ favorite go-to snacks. The cocoa-flavored dip feels like an extra-special treat! 14. 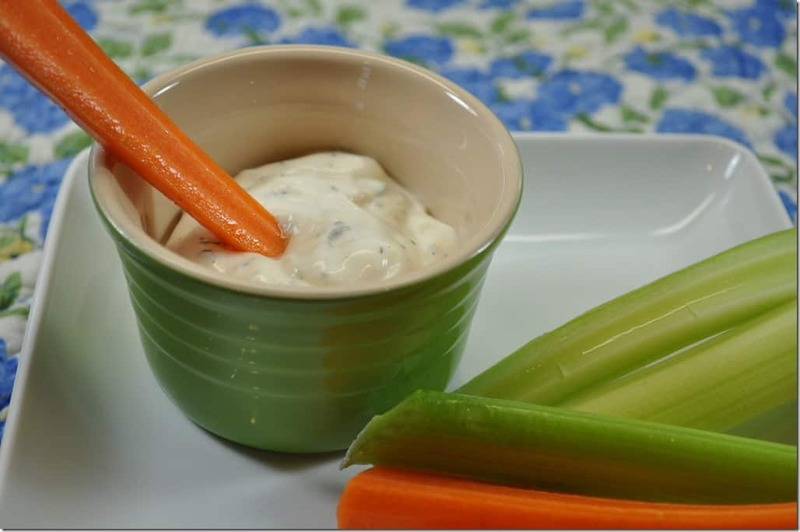 “Pirate Swords” with Homemade Buttermilk Ranch Dip: slice carrots and celery into long, pointy sticks. Dip these “pirate swords” into my homemade buttermilk ranch dip (or use store-bought Ranch dip if you prefer!). Recipe is here. 15. 2-Ingredient Mini Muffins: sized just-right for snack time, these miniature muffins use only 2 ingredients, and give your little ones an extra bit of veggies! Get the recipe here. 16. Homemade Trail Mix: this can be a blend of just about any of your favorite ingredients! We like to mix together some whole grain cereal (such as Quaker Oatmeal Squares or Honey Nut Cheerios), some raisins, some small pretzels or pretzel sticks, some almonds or peanuts, and, if I’m feeling really nice, some M&Ms or dark chocolate chips. 17. Peanut Butter Graham Cracker Sandwiches: another one of my favorite snacks when I was younger! Spread some peanut butter in between graham cracker squares. The perfect salty-sweet combo! 18. “Party Dip” with Graham Cracker Sticks: Stir together some vanilla Greek yogurt and some rainbow-colored sprinkles. 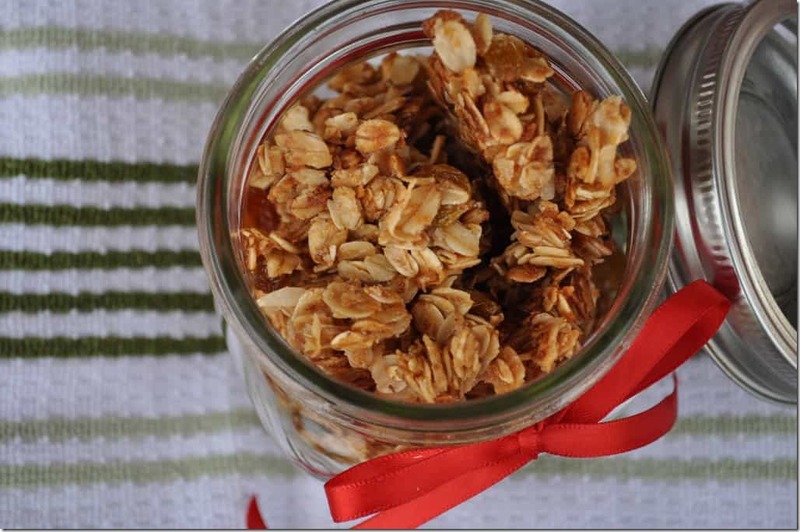 Let your kids scoop up the healthy “party dip” with some graham cracker sticks. 19. Fruit Roll-Ups: when I was growing up, my mom often made us cream cheese and jelly sandwiches. That’s a combination I don’t see much anymore, but I like this twist for a quick and easy snack: spread a thin layer of cream cheese or peanut butter on a whole grain tortilla. Top with slices of strawberries or bananas, drizzle with honey, and roll up. Slice into rounds for little-kid-sized bites. 20. Yogurt or Milk topped with Homemade Nut-Free Granola. The best granola that you will ever eat! I promise. Get the recipe here. Enjoy this post? Join me on Facebook and on Pinterest to keep up with all of our adventures!